H.J. Martin and Son constantly strives to continue the education of its team. Starnet Mega training is a beneficial learning opportunity that the company takes advantage of every year. Members of the H.J. Martin and Son team who attended the event held in Las Vegas were Gary VandenLangenberg and Rick Pellonari. Course topics included leadership, sales training and Starnet Floor Care, in addition to the ICRI Certification classes. The leadership training in particular instills skills that can be taken back that directly affect the experience of the customer. In addition to the Starnet training, the H.J. Martin and Son team also attended INSTALL: International Standards and Training Alliance of Floorcovering Professionals. Team members who attended INSTALL training were Mike Thomas and Dave Stevenson. INSTALL training courses are based on guidance from technical and education representatives from major manufacturers throughout the country. 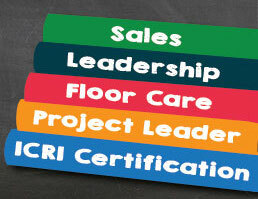 INSTALL only allows the most skilled and professional contractors to gain certification. H.J. Martin and Son continually receives INSTALL training, which requires in-depth training and an extensive curriculum. INSTALL standards are reviewed on a consistent basis by the U.S. Labor Department. Continued education and training has always been of utmost importance to H.J. Martin and Son to best serve our customers.